Low-sodium boneless skinless chicken breast is a wonderful part of most healthy diets. It’s versatile, easy to make and can be served any number of ways. Most standard recipes call for generous amounts of salt to be added. If you’re on a low-sodium diet or just want to cut back on the salt, it can be a challenge. This recipe will add tons of flavor and contains no added salt. Chicken naturally contains sodium, but only a small amount – approximately 60-75mg per serving. Many store bought chicken can contain added sodium, and a lot of it, so be sure to check the label on the package. Look for ‘natural’ or ‘organic’ on the packages too. This recipe uses ingredients that will bring out wonderful flavors in the chicken and satisfy the lack of salt. The primary ingredient is the white wine vinegar. It adds a subtle and delicious flavor when combined with the lemon and pepper. Even with just the white wine vinegar and olive oil, you’ll have a delicious meal. 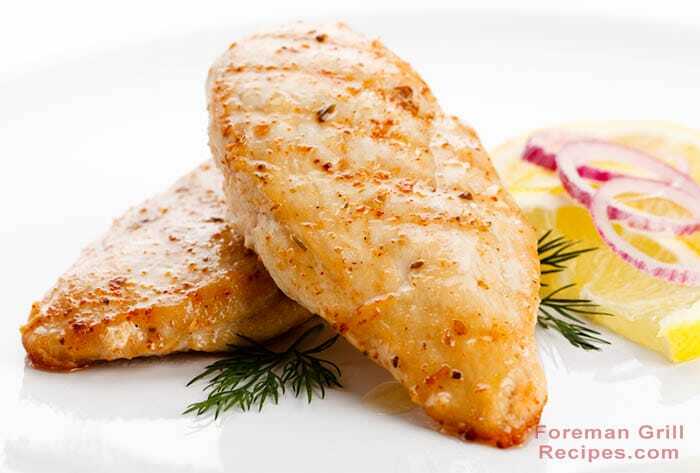 Pounding the chicken breast thin is an important step to successfully grilling it on your Foreman Grill. Especially without the added salt, it will greatly help tenderize the meat. Once the chicken breasts are pounded thin, place in a shallow dish with remaining ingredients and coat well. Letting it sit in the fridge covered for at least 30 minutes will allow the meat to marinate nicely. If you can let sit overnight – even better! Preheat your Foreman Grill for at least 5 minutes with the lid closed. Use ‘high’ setting if your grill has it. Place chicken on grill and close lid. Let grill for about 5 minutes. Check for doneness. You do NOT want any pink in the middle. An average 6oz chicken breast of 3/4″ thick will take 4-6 minutes. Internal temperature should be 165 degrees. Remove from grill and let rest on a plate for a couple of minutes.